12V to 13.8V DC/DC converters regulator from 100 to 700 Watts in stock at PowerStream. High power 12 volt to 13.8 volt DC/DC converters at low cost. Suitable for voltage stabilization of automobile electronics, special purpose UPS, etc. These are Boost Converters. which put out 13.8 volts with an input voltage of 12V nominal. (10-15V) We stock other output voltages in the PST-SR700 package, see our web page for options. We also stock an adjustable version of the SR700 that runs from 15 to 24 volts. This adjustable dc/dc converter (PST-SR700-adjustable) has a front panel knob to adjust the voltage, but is otherwise identical to the fixed voltage converters. 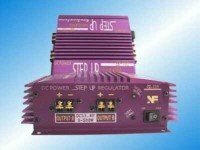 Isolation Although the output is isolated from noise, spikes, and voltage sags on the input, the input and output grounds are common, so this dc to dc converter is not usable in positive ground cars without totally isolating the equipment being powered from the frame of the car. *The two sets of output terminals are connected together, you can draw all the power from one or the other. There are two sets of terminals for convenience in case you want to run more than one piece of equipment. The following efficiency measurements were made by the U.S. General Fuel Cell Corporation, and are used with permission. Inexpensive high current DC/DC converter stabilizes voltage in automotive applications. Also can be used to provide regulated 12 volts from a sealed lead acid battery--excellent for special purpose UPS DC battery backups. Although this was designed for audio equipment, a number of customers have wanted to use these (and their sister products) in RF applications. Several customers have used these for Ham Radio applications and loved them, others found way too much noise for the converter to be useful. This was a puzzlement. It still is a puzzlement. However, recently I asked one of our engineers to dust off our old screen room and investigate the noise. We found that at full power and lower there was very little radiated noise, using 2-3 foot cables on either end. We don't have a calibrated antenna, but if you left the screen room door open just a crack the background radio noise swamped out the converter's radiated noise. Conducted noise, however, was not below the background, particularly in the 10 to 80 MHz band and so I asked him to do a noise reduction project. It took about a month of his spare time, but he was able to reduce the noise by a factor of 20 in this band. The noise at other frequencies was also reduced quite a bit, but he didn't quantify it. I have always suspected that manufacturing errors or variations might explain why some people see low noise and other see high noise. One of our customers is returning a unit in early 2007 that he has problems with and we are anxious to take a look at that to see how it performs and how our noise fixes work with it. Another answer to this puzzlement may be that some radios handle conducted noise on the power supply better than others. But there haven't been enough reports to make any conclusions on this from our end. Hopefully more news in the near future.